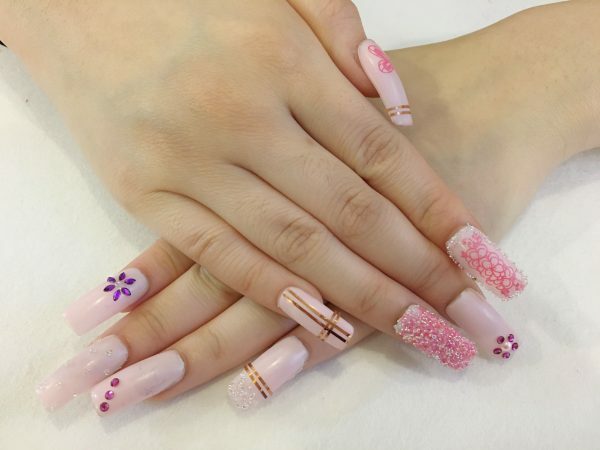 Now, here comes the third post on this year’s favorite nail ideas. 7) French tip design – Make a change to the plain French style. In the pictures we show you some very cute and very chic polkadots and glitter designs on the crescent tips. 8) Whole hand ombre nails – Horizontal ombre nails has been around for a while now. This time, you can go whole hand ombre for a change. Choose five polishes of the same hues that vary from lightest to darkest. Start with the lightest shade on the first fingernail. Gradually change to a darker tone on each nail across the hand. 9) CRYSTAL PIXIE – Add a dash of dazzle to your nails with crystal pixie. Tiny bits of 0.1mm Swarovski cut crystal pieces sparkle on the nails, creating a Milky Way on your fingertips.